It’s never too early to build a connection with Alberta’s fish, water and wildlife. Bow Habitat Station offers a number of ways for your preschool group to explore Alberta’s wild side! Bookings for preschool programs are now open! Preschool and toddler group bookings in November and December 2018 will receive a 10% discount. Bookings are subject to availability and booked on a first-come, first-served basis. Bow Habitat Station reserves the right to change or cancel certain program activities where extraordinary circumstances warrant, due to weather or other unforeseen business interruption. 403 297-6561 to book your group. Children 3-5 learn together through 45-minutes of hands-on learning. Staff-led activities encourage participatory investigation of Alberta’s wildlife. Program fees include self-guided Discovery Centre exploration. Children journey through the lifecycle of a rainbow trout and discover the unique patterns of Albertan fish. This hands-on program ignites investigative exploration by immersing children in the life of a rainbow trout from egg to adult while discovering how fish survive in Alberta’s aquatic ecosystems. Step into the footprints of Alberta’s wildlife to discover who lives here. Children will explore animal movement and practise track identification on an investigative scavenger hunt through the Discovery Centre. 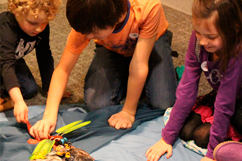 Learn about Alberta’s wildlife and nature with your family through hands-on Investigation Stations and a staff-led program in the Discovery Centre. A new theme is explored each month. Group rates available for bookings made at least three days in advance. Bring a group (up to 30 people) for $99 + taxes. Cost includes Discovery Centre admission, access to Investigation Stations and a classroom rental from 10 AM – 12 PM or 1 PM – 3 PM. Space is limited; call early to avoid disappointment. Immerse your group in an unforgettable experience focused on Alberta’s fish, wildlife, water and aquatic ecosystems! Create a unique experience with selections from our Build Your Own Adventure activities. * Groups are based on a maximum of 30 people, including children and supervisory adults. Adult supervision is required at a mandatory ratio of 1:4. Larger groups may book additional programs. Students must remain with supervising adults at all times.